Since they came out and I got my hands on some, the Altra Lone Peak 3.0’s have been my go to shoe. After close to 400 miles on a pair I found myself around 30 miles into the Back 40 trail race. Thanks to my trusty Mino shoe trackers I knew that this was going to be my final run before they were “dead”. Let me tell you those last 10 miles on some worn down shoes were not pleasant. I was pushing pretty hard and passed a guy wearing a pair of the new Altra Olympus 2.0’s. Maybe I was just tired but it looked like he was running on pillows of fluffy white clouds. 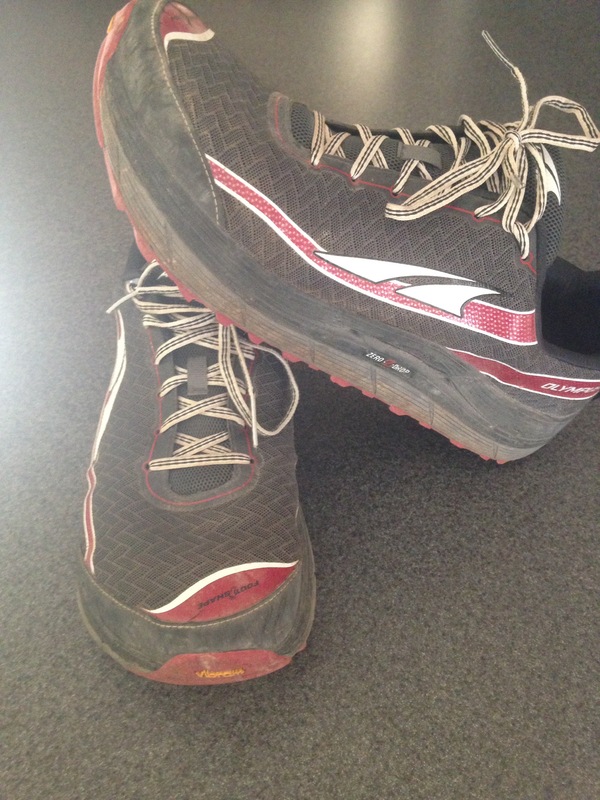 Right then and there I decided that for any distances longer than 50k I’d need some shoes with more cushioning. I told Summer my plans and ordered some Olympus’ that night! At first glance they are a lot more shoe than I’m used to but I was excited to feel that they weren’t overly heavy. It took a few runs to get used to the stack height being taller than my other shoes but the switch was effortless. The outsoles are by far the most impressive change from the previous models. The aggressive lug pattern and Vibram rubber grip the trails like no shoe I’ve ever worn. Combine that with all of the things that I love about Altra’s and I found a winner going into the Bandera 100k. The shoes performed perfectly on the technical terrain of South Texas. Over the 62 miles I had no discomfort, they held up to the distance as I had hoped. I may not use them as an every day trainer but they will definitely be with me for the longer ultra distances. One thing that I like about the Altra lineup is that they make a shoe for most situations. I have Superiors(minimal), Lone Peak(mid cushioned), and Olympus(max cushioned). The three are interchangeable for me and I just choose my shoe depending on the distance/terrain. Previous Post Putting together an amazing team for 2017!! Next Post Carson Footwear Ambassador Team! !